The best stories are often the most simple. They just seem to flow, and are usually character driven. “I started to kick around the idea about how hilarious it would be if a horror movie fan thought that a vampire was living next door to him,’ director Tom Holland told TV Store Online when asked about his vampire comedy, Fright Night. It took Holland just three weeks to write the screenplay, and he admits to laughing the whole way through. ‘There’s something so intrinsically humorous in the basic concept,’ he explained, and it is hard to refute that fact. Fright Night may not have the comic book appeal of The Lost Boys, but as a genre movie it is much more skilfully defined, buoyed by a dose of wry social commentary that pays homage to the outmoded staples it so lovingly sends up. Key to its success is the performance of Roddy McDowell as a thespian ham who made his name slaying onscreen vampires, and who now presents his movies to an ever-dwindling audience on late night horror show Fright Night. Not only does Peter Vincent share the names of two of Hammer Horror’s most famous actors in Vincent Price and Peter Cushing, he imitates their performances to an overstated tee, his particular style as dead to the mid-1980s as a dust-coated mummy in a desert-bound trailer. Initially, the role was intended for Price himself, and McDowell was reluctant to simply parody the Hammer legend, which is why he decided to portray him as a terrible actor. This decision is key to the character’s appeal as a worn-out phoney forced into a moral transition, as is the time and place in which that transition takes place. 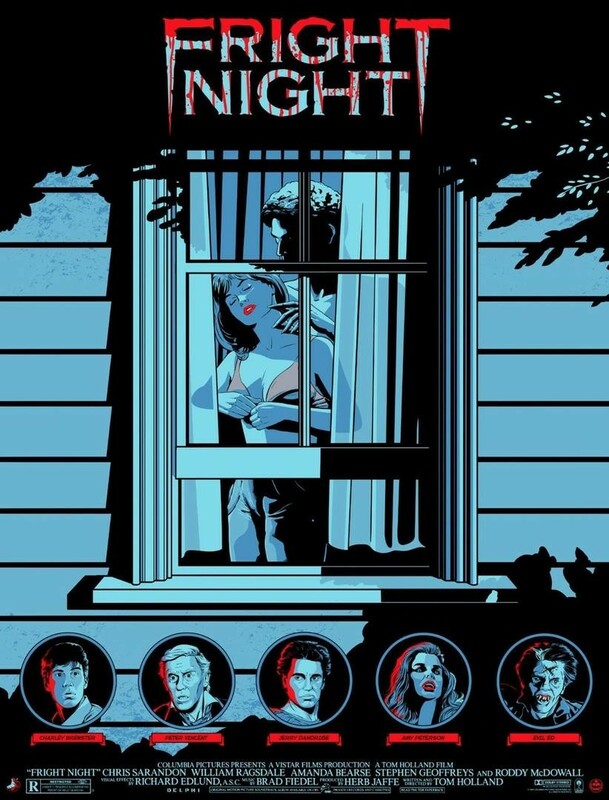 What Fright Night does is reinvent a genre lost in the overabundance of nihilistic slashers populating the period. When Peter Vincent is first confronted by his future partner in vampire slaying, he has just received the boot, attributing his misfortunes to the cynical tastes of ’80s kids, who would rather see madmen in masks stalking drunken teens than anything he brings to the table. The irony is, he fails to practice what he preaches. Not only does Vincent not believe in vampires, he is a self-aggrandising coward devoid of ethics, sighing at the prospect of autographs he was never asked for and accepting $500 from a couple of broke teenagers looking to trick Brewster into accepting that vampires do not exist. Peter Vincent – I have just been fired because nobody wants to see vampire killers anymore, or vampires either. Apparently all they want to see are demented madmen running around in ski-masks, hacking up young virgins. The problem is, they do exist. Not only do they exist, but one is living next door to Charlie in the form of Chris Sarandon’s toothy suburbanite, Jerry Dandridge, a mysterious, night-bound individual who appears just as mutilated bodies begin popping up all over town. After reading Holland’s ‘amazing’ screenplay, the in-demand actor would have a change of heart, and we have to count ourselves lucky that he did. Sarandon is a revelation as Dandridge, irresistibly dashing and sublimely sadistic, stalking his victims via Holland’s omnipotent, high-angle shots and appearing everywhere at once, as elusive as the smoke which haunts the town’s alleyways and as convincing to the imagination. Beneath his suave exterior, Dandridge is also devastatingly brutal, cutting a fearsome figure both before and after transformation as special effects maestro Richard Edlund delivers some of his best work, creating practical effects that are gruesome enough to appeal to the movie’s modern audience, while maintaining enough of the schlocky appeal synonymous with the bygone era it pays homage to. The Terminator‘s Brad Fiedel also adds his inimitable touch to the movie’s towering antagonist with a smouldering, guitar-heavy theme that typifies his ethereal persuasiveness. Much like Vincent, what makes Jerry such a unique character is the era he finds himself in, and the smug casualty he exudes while embracing it. Dandridge is as cocksure as they come, safe in the knowledge that vampires have long-since become passé. Not only do people not believe in them, they are no longer a part of society’s consciousness, and his ’80s incarnation brazenly claims as many victims as he desires, confident that knife-wielding psychos are the suspects of the day. When Peter Vincent gives Dandridge some fake holy water to drink, our supercilious vamp downs the liquid with a gleeful relish, chortling sadistically after kissing Amy’s hand and performing his best Vincent Price impression. After all, that’s what vampires are supposed to do. McDowall and Sarandon prove the movie’s key players, but there is stellar work from top to bottom, from William Ragsdale’s pale-faced protagonist to his long-suffering sweetheart, Amy (Amanda Bearse), her transformation from high school frump to sultry vampiress really quite staggering. There is also a fine performance from an exceedingly young Stephen Geoffreys, whose personality is allowed to flourish when he is turned into a freakish minion, suddenly mad with power after years of schoolyard bullying. Jerry Dandridge [after kissing Amy’s hand and saying ‘charmed’] Isn’t that what vampires are supposed to do, Charlie? With an insouciance that is hard to resist, the slick and socially adjusted Dandridge almost has everyone believing Charlie’s insanity, but when Vincent drops his vanity mirror after finding no reflection for this supposed creature of the night, Dandridge turns up the heat, a move hastened by the fact that Amy bears a striking resemblance to a woman he knew many years ago, and who he sets about enslaving. Initially, the not-so-fearless vampire killer shows his true colours by fleeing the scene, but when the newly turned Evil is sent to dispose of him, Vincent has no choice but to call on the knowledge and instincts of the character he has for so long portrayed, returning to the undead abode with his case of Dracula repellents, where he soon realises that true faith is required if he is to free Amy from Dandridge’s hypnotic grip. It is this irony that makes us get so firmly behind the Vincent character. We can laugh at his flamboyant pretence. We can marvel at his physical cowardice and sham persona, but beneath it all we know this is a good man facing unprecedented odds, and as an audience we love nothing more than an underdog, especially those who begin without a heroic bone in their body. This isn’t Luke Skywalker and Darth Vader. This is a washed-up fraud facing an altogether real threat: a bona fide Nosferatu who prefers the comfort and convenience of suburbia to the faraway castle. This monster does not reside in a mythical land, he is right on Vincent’s doorstep, and he is the only one even half qualified to rectify that. In spite of the dominance of the likes of Krueger and Voorhees, the 1980s produced some unique and well-loved vampire flicks, movies that will go down as some of the most memorable in the entire genre. The Lost Boys will invariably prove the cult favourite, while a young Kathryn Bigelow gave us the darkly distinctive and devastatingly bleak Near Dark that very same year. 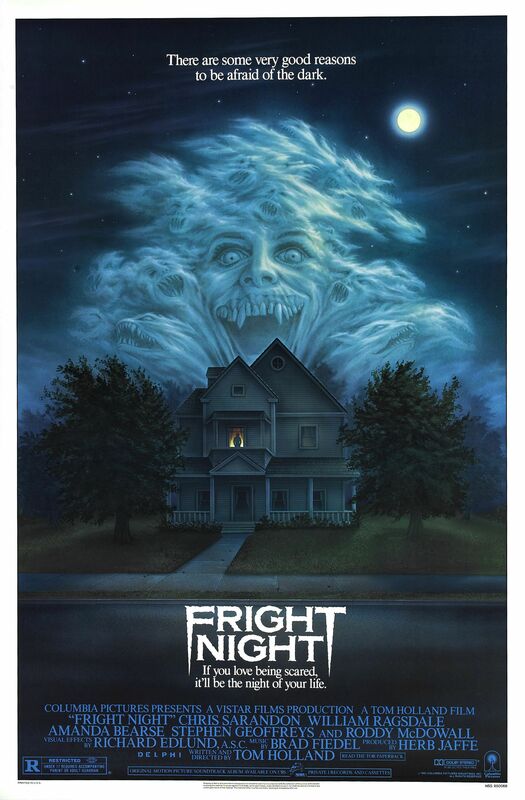 Of those three movies, Fright Night is perhaps the least lauded, and for the life of me I can’t imagine why. It may not have the star power of Joel Schumacher’s brat pack-laden extravaganza, or the seminal qualities of the stylish and emotionally barren Near Dark, but as a genre piece it is a near perfect production, and one of the most satisfying low-key treats of the decade. I’ve all 3 films, ‘Lost Boys’, ‘Near Dark’, and ‘Fright Night’, in my dvd collection. True, ‘Fright Night’ is underrated as compared to ‘Lost Boys’, but I do enjoy the ‘bleak’ ‘Near Dark’, as a more aggressive and gritty blood sucker movie. 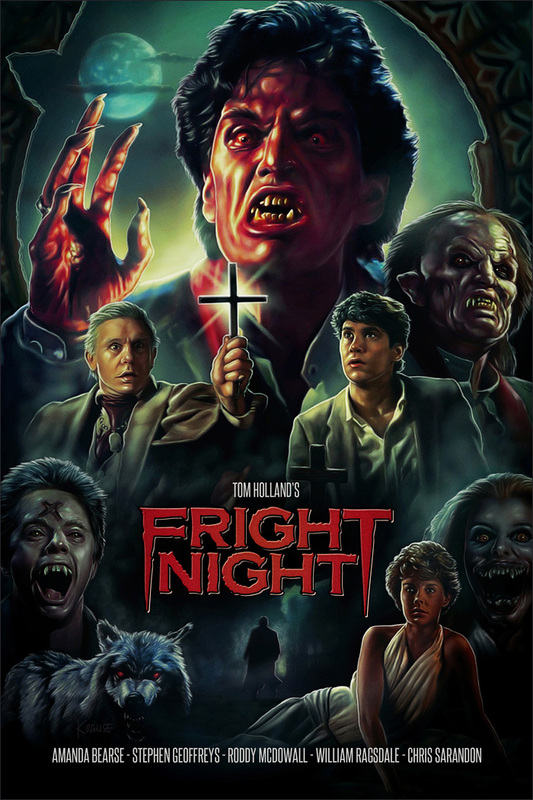 The 2011 attempted revival of ‘Fright Night’ featured a cameo of Chris Sarandon as a victim of Colin Farrell’s vampiric Jerry. Hello again, Louis, my friend. Near Dark is a beautiful movie. I do love The Lost Boys, but I don’t think it works quite as well as Fright Night, which is just an incredibly smart movie. All must haves for any collection though, I must say.